BRICKFORM Liquid Color is made from the finest UV-resistant pigments available. BRICKFORM Liquid Color is produced to a one-percent tolerance to established plant standards and also complies with ASTM C979, Pigments for Integrally Colored Concrete. BRICKFORM Liquid Color is designed to suspend and disperse the iron oxide pigments evenly. BRICKFORM Liquid Color is available in standard and designer colors. Custom colors and color matching are also available. For more information about our ColorFlo liquid color and packaging options click here. Integrally colored greatly enhances the appearance and value of your home. The color in integrally colored concrete products lasts forever, unlike painted surfaces. The possibilities are endless with colored concrete products. Next, choose the surface appearance you desire. Those can be a traditional broom finish, a smooth hard troweled finish, a polished surface, or one of our many stamped concrete designs. To view options, look at our project gallery. Expectations – Integrally colored concrete provides a natural looking colored surface that will last forever. Integrally concrete color is not like paint in that it may not provide an exact match to our color card. The natural raw materials in concrete can affect the final color of the concrete project, meaning the final color may be slightly different. Unlike paint, however, integrally colored concrete appears more natural and will not require frequent repainting. This makes it a perfect solution for low maintenance and sustainability. Expectations – Due to variations in regional cement and sand across the country, concrete color may not match the color card as exactly as paint. Final color will be within the same color range, but may end up with a slightly different shade because the color is part of a homogenous product, with the cement, sand, and aggregates. This homogenous nature also means the color will be more durable, longer lasting, and more sustainable than painted concrete surfaces. Our integral colors pair very well with the other BRICKFORM decorative products. Integral color is the best way to color concrete because it is durable and long lasting. However, it is important to set realistic expectations when using colored concrete. The finished project may not have the exact shade of the color card, though it will be close. Because the color mixes with the concrete, which may vary in composition by region and jobsite, the final shade is affected by make-up of the concrete. This will, however, result in a much more natural appearing, durable, and sustainable coloring solution than paint. 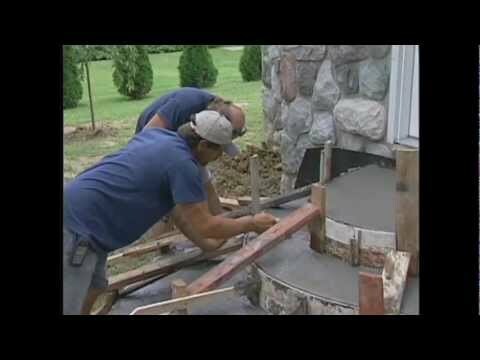 This is an introductory video on how to stamp concrete using Solomon and BRICKFORM products. We show you how to stamp a concrete slab and concrete steps using integral color and color release. Solomon Colors is the most trusted supplier of decretive concrete products in the world.